Most businesses recognize the role their senior leadership teams play in driving financial performance. Yet measuring the direct impact of company leadership on outcomes such as corporate earnings or equity value has proven difficult for researchers. Deloitte spent six months (August 2011 to January 2012) studying investment analysts’ perception of the relationship between corporate leadership and performance. Financial results remain the most important criteria investment analysts use to evaluate a company’s current and future success, but increasingly, analysts are incorporating judgments about senior leadership into their equity valuations. Senior leadership team effectiveness ranked as the second most important criteria analysts use to determine company success in Deloitte’s survey. The majority of analysts (52 percent) say they routinely factor it into their valuations. They believe a company’s financial performance reflects the effectiveness of its senior leaders. In other words, the numbers demonstrate their results. Even many of those analysts who don’t routinely ascribe equity value to senior leadership would place a premium valuation on an exceptional team. Overall, 80 percent of analysts surveyed say a company with a particularly effective senior leadership team would receive a premium valuation. The same percentage said they would lower the valuation of a company that they perceived to have a particularly ineffective leadership team. The gap between the value of a company with good leadership and that of a company with weaker leadership could be more than 35.5 percent, according to the study. On average, analysts place a premium of 15.7 percent on companies with particularly good leadership and a discount of 19.8 percent on organizations with weak executive teams. “Some analysts stated that concerns about the quality of a senior leadership team would be enough for them to avoid investing in a stock,” says Canwell. Deloitte’s research suggests that the relationship between a company’s leadership and its share price varies by company size. Across markets and industries, analysts agree that senior leadership exerts a far stronger influence—both positively and negatively—on small companies than on large companies. “In small and early stage high-growth companies, the level of risk is higher than in large, mature organizations, and the decisions senior leaders make ultimately determine whether a company is able to navigate that risk successfully,” says Canwell. Moreover, he adds, leaders in small companies tend to have more freedom to alter the direction of the company because they’re less constrained by long-established processes and protocols that may hinder their counterparts at larger organizations. 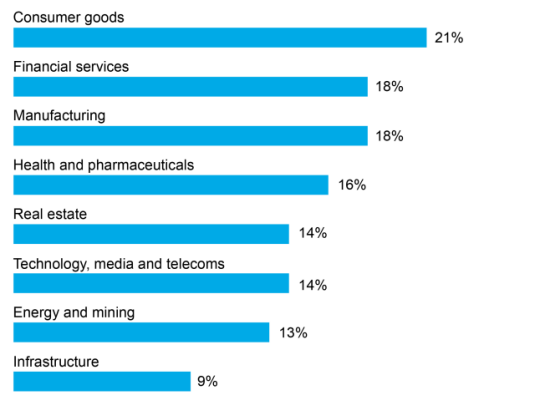 The importance of a company’s leadership to its equity value also varies by industry. 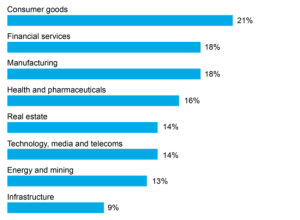 For example, analysts who focus on consumer goods companies ascribe an average of 21 percent of a company’s equity to its senior leadership team, compared with 14 percent for analysts who cover technology, media, and telecommunications companies (see Figure 1). By contrast, the impact of leadership on financial performance is often delayed in industries that are undergoing rapid and radical structural transformation, such as technology, media, and telecommunications, adds Canwell. Consequently, financial analysts find the senior leadership team’s contribution to the company’s performance harder to quantify.